FunMouse - It's the best software for your mouse. . . Period! Ever thought how many times a day you handle the mouse. . . Well, if you are anything like me, you'll be surprised once you realize the thousands of clicks you perform on a daily basis, not taking into account the many miles (yes, I said miles) the mouse travels each day. I have always been unimpressed by the lackluster functionality that came with the default driver software. I ended up buying a high end mouse, but alas, the bulky software that accompanied it still imposed so many restrictions I eventually started looking for alternatives. I started looking at 3rd party software solutions, but most, if not all of these solutions assumed I desired the exact same features the software author intended or the software changed the normal functionality of my mouse so drastically you actually had to learn to operate it from scratch.
. . . and so a concept evolved! In 2013 I started developing a solution to allow me to operate my mouse like I've always handled it since I got my first computer, yet, allow me to enhance the functionality to achieve infinitely more than was originally intended. The result materialized into the first version of FunMouse. After my friends and colleagues saw all I could accomplish with the software, they were so intrigued, they demanded a copy for themselves. This in turn led to registering the domain funmouse.org and I started offering the software to anyone interested as free-ware. Soon requests started coming in for more features. . .
We have reached the stage where the upkeep, maintenance, hosting and ongoing development of the software has reached the point where we either had to start asking a fee to register the software or drop the project altogether. Although the cost of keeping the project alive wasn't warranted I still battled with the approach of charging people for what I essentially viewed as complimentary software. As such, we went back to the white-board to find a solution and, after a few compromises, a new objective was born. 1. The cost of the license had to be extremely low. My partners suggested selling the software for . . . well, let's just say though modest, I still thought it ridiculous and dismissed it right away! We do require income to continue developing FunMouse, but we do not need a lot. 2. The cost of a license had to be one time only. No matter how many additional features we come up with or what version of the software we reach, consumers would only pay one low licensing fee and be eligible for lifetime updates. 3. The referral process had to be dead simple, yet deliver nuclear results. The Internet is flooded with make-money-from-home schemes. We aim to be different. Remember, we did not set out to create a money-making program. It purely came about as a happy accident for wanting to reward our members for helping to keep the project alive. To this end, we created a solution in the members area with step by step instructions getting 2 people to this site who will obtain a copy of our software. Why 2 people? Because we believe, with our incredible blueprint anybody can refer 2 people. 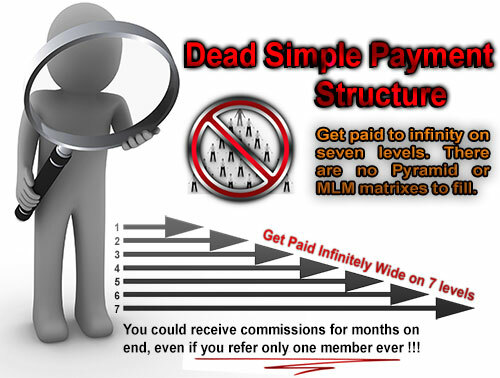 . . and if we let you realize how ridiculously simple it is to get two people, we can also do it for anyone you refer. In Fact: 98 out of 100 people visiting this page got here through the step-by-step system we equip our members with which is likely the way you got here too. And if we got you here with our system, what makes you think we can't repeat the same process to get 2 people for you? Once you've had your first nervous giggle after realizing how stupidly easy it was to effortlessly make your first $500, we are absolutely sure you will repeat the process over and over again. The FunMouse website is also "Any Device" ready which means people you refer will have a great experience no matter what device they view the site on. 4. Members have to be rewarded multiple times. The biggest failure with practically every other referral program is that they reward their members once and then forget them. Yet, they forget, it is these same people who keep them in business. This was one of the biggest obstacles we had to overcome as we needed people to be rewarded over and over again even if they only ever referred one of their friends to us. But, how can this be accomplished when all members will only ever pay one low fee for a lifetime license of the software? will forever change your life and bank account. All of these people will receive commissions upon you joining today! No, you will only ever pay a once-off fee which entitles you to all future upgrades. What about one-time-offers, up-sells and down-sells? We don't believe in tricking people. What you see is what you get. As explained in the answer above, you will never have to pay anything other than the once-off cost of the software. There are absolutely no hidden costs. Do you really offer a triple-your-money-back refund? Most certainly, and unlike some sites using it as a sales gimmick, we actually remind you about it inside your members area. How can we offer you triple your money back? As soon as you have implemented our step-by-step system, we know the process to start sending referrals is set in motion and reversing it is next to impossible. As such, we are more than happy to move your account under the Admin and compensate you for doing the work on our behalf. What if I am still not convinced? Can I get access to the members area? Absolutely! We believe in complete transparency. Simply click on the support link at the bottom of this page to create a help desk ticket and we will create a demo account for you. Short of withdrawing commissions and downloading the pro version of the software, your account will be fully functional. We usually respond to support tickets within 24 hours on business days. 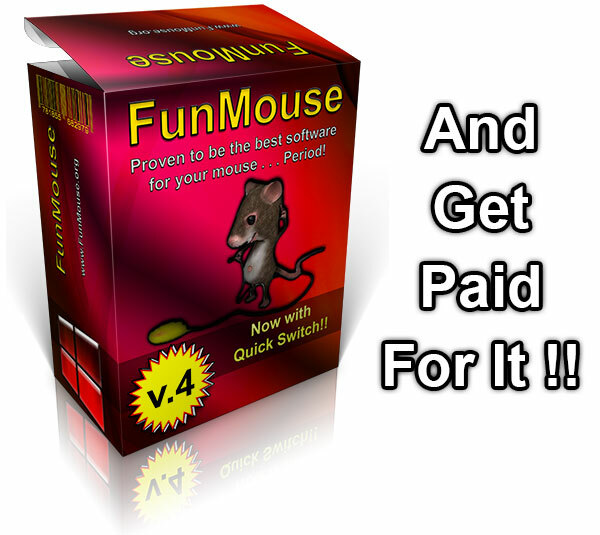 If, after having gone through everything in the members area (especially the start page and the step-by-step system) and you are not convinced FunMouse is the easiest money you will ever make on-line, tell us why and we will reward you with a fully licensed copy of the software for life, simply for sharing your thoughts! These shortcuts can be assigned as the default (when no other action exists), per application and global. When a shortcut is performed FunMouse first checks to see if an application shortcut exists and if not, executes the default shortcut or action. However, if you don't want to hunt through all the settings and quickly want to add a new application shortcut, simply hold in the Shift key and perform a gesture, hotspot touch or hotspot click while the Shift key is being held down. Seeing that you can assign actions and shortcuts to every last application you have installed on your system, it could be quite daunting when you reformat your system or move to a new PC. When FunMouse is installed, it creates 7 hot spots along your computer screen's edges as well as one more centered on the task-bar. This is a great way to accomplish tasks in applications where keyboard shortcuts in the application can be assigned to a hotspot touch action. Similar to hotspot touches, except in this case, the user can perform an assigned action by left or right clicking the mouse. 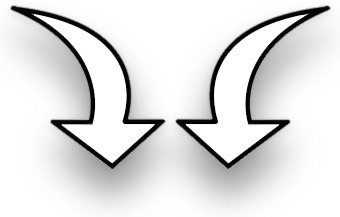 When you double-click (left or right) one of these hot spots, your assigned action / shortcut will be executed. To ensure you don't accidentally execute an action / shortcut, a double-click is required before FunMouse will recognize it as an action / shortcut to be executed. Perform quick window actions (like back & forward) in a web browser or file explorer, launch programs or perform application specific functions by simply holding down the right mouse button while performing a pre-defined mouse movement. FunMouse also comes with 4 configurable quick launch toolbars to easily launch all your favorite applications. The toolbar can be triggered by either touching the bottom of your task-bar or you can assign it to a gesture, hotspot shortcut or even assign it to one of your extra mouse buttons. When the default toolbar is open, simply hover the mouse above it and scroll your mouse wheel to see other toolbars. Quickly adjust the system volume by scrolling the mouse wheel when hovering the mouse over the task-bar. FunMouse also sports one of the best volume on-screen displays in the business that changes color the higher the volume goes. Adjusting the volume through FunMouse also does not display the ugly square volume OSD introduced in windows 8. 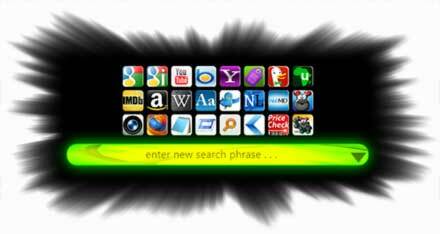 Perform a web search from any windows application to your favorite search engine with one click. Paste images and text to any application or take customized screen-shots without using any third party tools. A lifetime license for the software. We are constantly adding additional features and optimizing existing ones. The license you receive will activate your copy of FunMouse to be used on 2 computers and entitle you to all future upgrades. Access to a massive resource of promotional material to get people to your referral site, including an option to opt-in to a weekly mail reminder to simply click a link in the email to have your site promoted to social media sites. Our groundbreaking step-by-step (monkey see, monkey do) system. So deadly effective a caveman can use it to sponsor unlimited prospects. It is this same system that allows us to offer you 3 times your investment back! 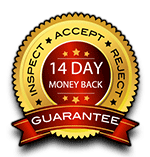 Have complete peace of mind with our Inspect - Accept - Reject 14 day unconditional money back guarantee. Should you feel this is not for you within the first 14 days or for whatever other reason you may have, simply log into your members area and request a refund. We process all refunds within 24 hours. Due to legalities we are prohibited from saying: Our exclusive step-by-step (monkey see monkey do) program is guaranteed to work for you. However, this is the next best thing we can do in addition to offering a 14 day unconditional money back guarantee: Show us where you implemented the above and we'll triple your refund! The best part . . . The whole system only takes mere minutes to set up!